It’s been another very busy day for Microsoft today. At Build, the software giant announced that the next big update of its new operating system will be called Windows 10 Fall Creators Update, and now we have a new build of that for Windows Insiders. Build 16193 introduces some of the new features that Terry Myerson announced on stage at Build, including the new Story Remix app and Power Throttling. 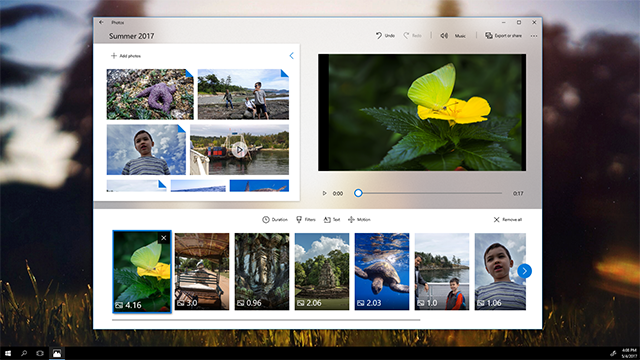 The Story Remix app is described as "an evolution of the Photos app" and makes it easy to relive memories and create video stories from your photos and videos. The app finds collections of content and automatically brings it all together into video stories with a soundtrack, theme, and transitions. You can leave the created video as is, remix it, or edit the contents however you wish. Content gets tagged automatically using deep learning and AI, so you can search for people, places, and things. As you can see in the screenshot above, the app is designed using elements of Microsoft’s Fluent Design, and there’s a discovery bar that gives you quick access to common tasks. Stories can be shared via email and OneDrive and/or uploaded directly to YouTube. Elsewhere in this new build, the Task Manager column name has changed from "Background Moderated" to "Power Throttling". We looked at this new feature previously here. 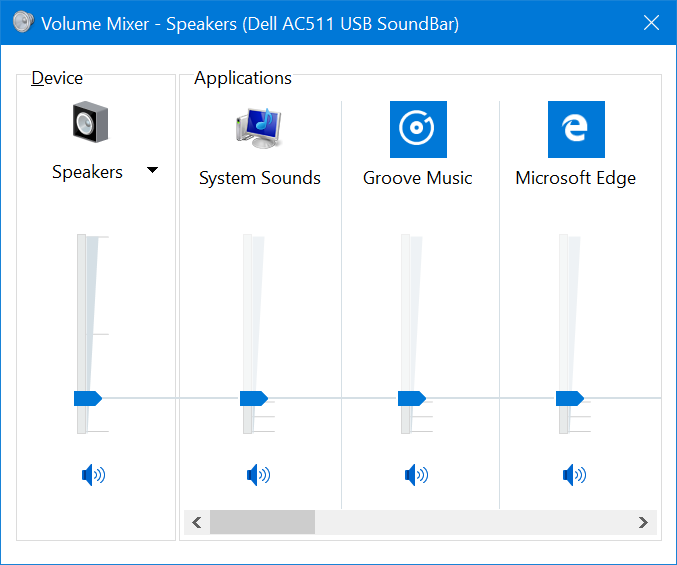 You can now also control the volume of UWP apps like Edge and Groove Music individually, which is a great idea. PC Reset via Settings > Update & security > Recovery works again on non-English Insider Preview builds. Navigating to Settings > Personalization > Lock screen should no longer crash the Settings app. Fixed an issue where Settings would crash on launch for Insiders using certain display languages, including Russian, French, Polish and Korean. If you were impacted by this on Build 16188, that means you won’t be able to open Windows Update to check for updates. However, your PC will download the new build in the background. Once the build is downloaded and staged, your device should automatically restart to install it when idle and outside of your configured active hours. Or you could go to Start and Power and choose to Update and Restart to install the build. Fixed the issue causing XAML designers in Visual Studio and Blend for Visual Studio to show an exception when a XAML file from a Universal Windows Platform project is opened. Fixed an issue resulting in some fonts not rendering properly in Greek or other single-byte system locales such as Hebrew or Arabic. Fixed an issue where the "clear all" button in Action Center wouldn’t work if a notification had been expanded. You can now use Ctrl + Win + N to directly open Narrator Settings. Fixed an issue where the Windows Store App Troubleshooter was erroneously showing the message "Not Fixed" instead of "Fixed" after following the steps to troubleshoot the error "Windows Store cache may be damaged". Fixed an issue from recent flights that could lead to the PC no longer recognizing any USB device until the USB Root Hub had been disabled and re-enabled in Device Manager. Windows Defender Application Guard (WDAG) will fail to work on touch PC’s, showing a solid black window on launch. Non-touch enabled devices should not experience the issue. A temporary workaround if you would like to use WDAG is to go to Device Manager, expand Human Interface Devices and disable the "HID-compliant touch screen" and "Intel Precise Touch Device" if they are present. After a reboot try WDAG again. Re-enable these devices to restore touch. [DEVELOPERS] The XAML designer in Visual Studio 2017 hits an error causing a squiggle error under ThemeResource references to XAML’s generic.xaml resources. Some Insiders have reported seeing this error: "Some updates were cancelled. We’ll keep trying in case new updates become available”" in Windows Update. See this forum post for more details. Outlook 2016 may hang on launch due to an issue where the spam filter gets stuck reading the Outlook Data File and the UI waits indefinitely for it to return. Microsoft is investigating reports that Edge fails to open PDFs with a "Couldn’t open PDF. Something is keeping this PDF from opening" error. You will be unable to type in your password to log in to the Facebook, Instagram or Messenger apps. A workaround is to use the "Login with the browser" button.